For anyone running a site or operation where hydraulics is used extensively on plant and equipment - especially if that set-up is distant from a source of parts and service - there can be a very strong economic and practical argument for developing hydraulic hose assembly capability on-site. Hydraulic equipment downtime costs money, and with studies indicating that hydraulic system failures are the key cause of 35 to 65 per cent of all downtime at locations where such equipment is part of the set-up, the importance of being able to make repairs quickly and effectively cannot be ignored. Added to this situation is the fact that the failures in question are very often linked to hydraulic hoses that require maintenance and regular replacement much like tires on a car. For businesses and operations located relatively close to resources such as a ParkerStore, or other sources of the required fittings along with expert and dependable resource to make the repairs and provide advice, then investing in the equipment and training to enable on-site hose repairs may not be necessary or sensible. The same may also be true if the amount of hydraulic equipment in use is small and therefore the likely frequency of repairs is low. However, if one or both of the two following situations is true then investing in on-site service and repair capability can become worthy of serious consideration. The first of these two criteria is when there is a significant distance between where the hydraulic equipment is in use and the location of the nearest source of parts, expertise and resource to carry out repairs – for example, a ParkerStore. The second situation is when there is a large amount of equipment on-site and therefore the likely frequency of the need for repairs and service is high. In this instance, having the necessary equipment and parts on-site can negate the need to travel to an external resource, which would become costly and inefficient, even if the distance were just a few kilometres. Clearly it is important to carefully consider the specifics of the individual site or workplace very carefully before concluding whether on-site or off-site hose repairs represent the best route to follow to keep costs and downtime to a minimum. Having on-site hydraulic hose assembly capabilities can enable quick repairs and reduces downtime to a minimum – typically sub two hours. In addition to minimised downtime, there would be no costs associated with travelling to a source of parts and service. 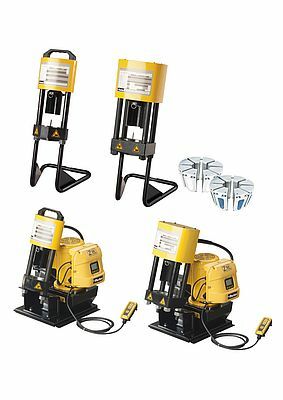 All that is needed is a minor investment in crimping capability as well as training of the employees that will be operating the equipment. The key item needed to repair hoses on-site is a hose crimping machine; it must be capable of making hose assemblies to factory quality and recognised international standards with the utmost repeatability. To get the maximum benefit out of such a device and to ensure that safe and effective hose assemblies result, it must be capable of being set-up without having to set any complicated gauges. All the operator should need to do is to cut a piece of hose to the correct length, push the fitting on to the hose, match the die to the hose size and crimp. It is important to match the size of the crimping press acquired for the on-site assembly of hoses and fittings to its likely frequency of use and the size of hoses at the location. As an example, ParkerStore offers its KarryKrimp1 and KarryKrimp2 units that meet the typical needs of small workshops and mobile service vehicles. These types of units can be used freestanding or mounted to a workbench. Power can come from hand, air or electrical pumps. The necessary die rings and a hose assembly for the pump are supplied with the unit such that it is ready-to-use. Larger machines are available that provide an optimal solution when the range and diversity of hoses and sizes is greater and the volume of repairs is expected to be higher as might be the case on larger sites that may have a permanent and dedicated workshop for carrying out a range of routine and emergency maintenance. The Parkrimp 2 from ParkerStore is an example of a crimping press designed to address this type of need. The bench mounted unit can accommodate hose types from size -4 to -32 including four and six layer multispiral hoses. This type of unit gives a reassuring level of flexibility, convenience and self-sufficiency for a large operation situated a long way from the required parts and third-party services. ‘Do-it-yourself’ hose crimping machines and associated equipment are now so advanced that the hose assemblies they produce are extremely tear-resistant because there is a keyed joint between the hose and the fitting. Also, leakage is kept to an absolute minimum – essential in environmental applications and where the highest levels of safety and protection are required – by the use of solder-free monobloc fittings and soft sealing elements. Also, by sealing the connection between hose and fitting when the fitting is crimped, the reinforcement layers are protected against corrosion, extending the lifetime of the hose and reducing the likelihood of it needing to be replaced, even when it is used in environments involving extremely high pressures. Other options that are available to simplify and enhance the operation of an on-site hydraulic hose assembly system include colour-coded die sets for mistake-proof crimping diameter setup. These also feature a chain link that keeps the segments together, they ensure no loss, mismatch or misplacement, and they deliver an ideal 360° round crimp for longer impulse life. Whatever equipment is installed to facilitate on-site hose assembly manufacture, there are five key parameters that should always be taken into consideration when carrying out work of this type. Before crimping a hose, the user should think 'STAMP' – size, temperature, application, media and pressure. Firstly, the hose size has to be big enough to prevent pressure losses, overheating or damage of the hydraulic system. 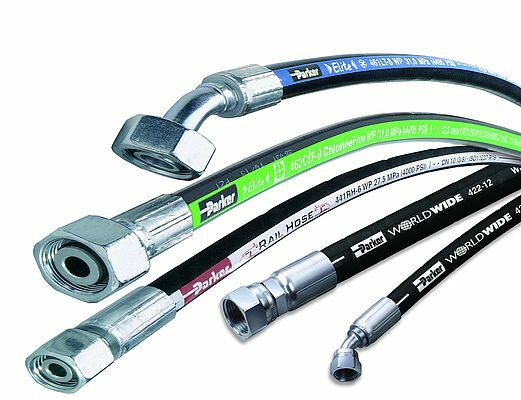 Then, although the standard working temperature for hydraulic hoses is -40°C to +100°C (or +125°C), if a hose is meant to work with medium, lower or higher temperatures, it is important to select a special type, either rubber or thermoplastic. In terms of application, hydraulic hoses are often expected to work in complex circumstances and there are no simple parameters that can cover them all – the final decision of which type of hose to use has to be down to the knowledge and experience of the engineer involved. As for media, if a workshop's hydraulic system uses fluids other than standard hydraulic oil, it is always advisable that the engineer checks its compatibility with the hose being used. And finally, pressure – the hose assembly working pressure must always be equal to or higher than the real pressure in the system, including all peaks, surges, spikes and pulses coming from the application. As a maintenance engineer should know, pressure resistance is indicated by the 'weakest link in the chain', so it is absolutely essential to check the working pressure of all fittings that are being used.